Added to the original post. It is at 28 consecutive conference road wins currently. I wonder where this squad ranks on 30 point wins. Gotta be setting a record there. Another amazing fact about Clarke is we all know scorers are missing 10-15% of his blocks (at least) in the stat book(s). They really need to tighten this up across the board in the NCAA. While it is a universal problem that seems to effect all shot blockers, the more blocks you make, the higher the number that are missed. His block rate is so high that you know that vs. others on any lists (GU career lists or overall NCAA lists) he is losing marginal credits. Hypothetical is to add 5 to 10 more blocks at this point and do the comparisons....just awesome. The Zags have 13 wins by 30 or more points, matching the 2017 squad for the most in program history. Brandon Clarke moves into the Top 10 on the GU career blocks list. Josh Perkins is 17 assists away from the all time GU record. He’ll need to average 5.67 over the next 3 games to break the record on senior night. Josh Perkins needs 52 assists to break the single season assists record. I added some categories based on requests made in this thread. Single Season Scoring; Single Season Field Goals Made; Single Season 3 pointers made. Apologies for the formatting on the new categories. I’ll try to find some time to fix that later. Mark Few is now 50th on the all time career list for wins in Division 1 Basketball! Last edited by former1dog; 02-15-2019 at 07:25 AM. Reason: Totaling Missed Rui Moving Up the All Time Scoring List!! Thanks F1D, One small nit to pick. Time to move Rui up the scoring list. He moved up to 42 last Saturday and 41st last night. Good catch! I totally missed that! Does anyone keep track of G Unit wins this season? Scroll back through this thread a page or two. . .
Another G Unit for Josh tonight. Can we keep him for a few more years? It took several decades (1967-70 UCLA under Wooden) for GU to break the all-time NCAA D1 record of 26 straight league road wins. Obviously, the Zags can get it up to 32 with road wins over Pacific and St. Mary's. Each win keeps padding the record, and it's a record that may never be broken. Who knows. Elite players stayed around 3-4 years, and that no longer occurs. But keep enjoying it and keep appreciating it because the record is probably going to end next season due to the amount of departures and youth that'll be on the roster. Obviously I hope it continues and continues, but as Few said when they broke the record, a lot of went into breaking the record was having lots of experience. It's needed to win these road games where the opposition you are facing is either a league rival or a team whose whole season is made by beating you. Josh Perkins only 8 assists from Gonzaga’s All Time Record. 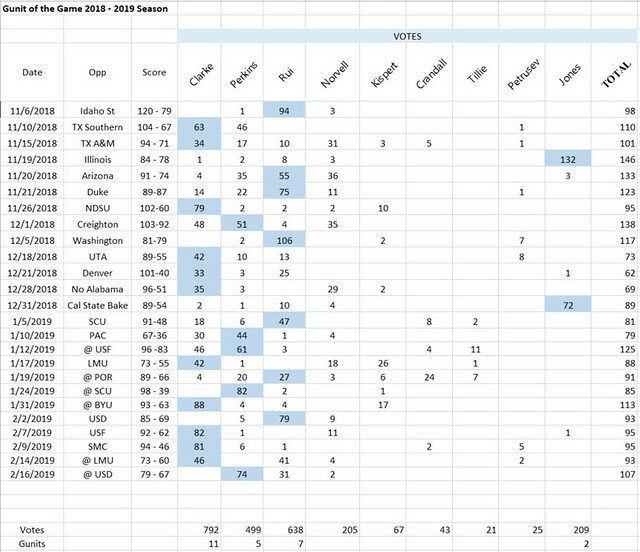 I think we’ll all be able to celebrate that milestone in 2 games on senior night vs. BYU along with Josh; Rui Hachimura moves into the top 40 for all time scoring at Gonzaga; Brandon Clarke in one season has entered the top 10 for career blocks; Josh Perkins moves into a tie for 2nd for all time wins at Gonzaga; Josh Perkins is now 43 assists away from the best single season assists ever at Gonzaga, he could do it by averaging just over 6 assists over the next 7 games. I’ll figure out the GUnit race and get it up to date next week. Thanks for the update Reno. Last edited by RenoZag; 02-23-2019 at 08:24 PM. I think I read somewhere that he sucked. Josh Perkins achieves the lead in the all time assists at Gonzaga with 9 on the night and 670 in his career. Next stop is the all time single season assist record. He needs 34 more this season to achieve that record! 1. Josh Perkins – 670 New All Time Leader!! Josh Perkins is ranked 6th for total assists and 7th for assists per game in the NCAA! Brandon Clarke is tied for 2nd in total blocks and is 3rd in blocks per game in the NCAA! Last edited by RenoZag; 02-23-2019 at 08:20 PM. Is it too early to give Josh Perkins his 6th G Unit for this season? It is not. Fixed it!